Blogging to spread awareness and knowledge regarding Cow's Milk Protein Allergy and other allergy-related topics! Personally, I don't like to put a damper on it, but I'm not so sure that it is so easy to ask!! 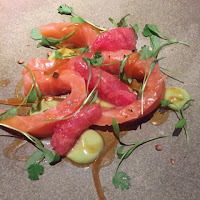 Not so long ago I went out to eat for another friend's birthday, where I was expecting to eat, quite safely, as the restaurant is quite expensive and I thought they would be cooking to order. So, a little complacent, perhaps, I turned up on the day, without my usual checks. I simply scanned the menu for something that looked pretty safe and when the waiter came, I asked for advice about the dish I had spotted. 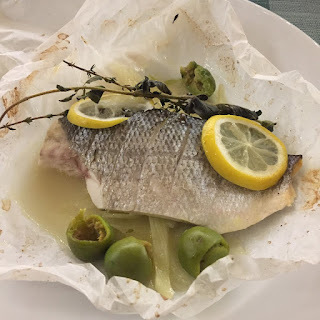 It looked to be a fairly simple sea bass dish - they are often my best bet. He was a foreign waiter, but seemed to understand me. When I asked whether it would be free from gluten, dairy, soya etc. he wasn't all that sure; he thought it would be fine, but would check. All seemed to be fine, so the order was placed. Another friend ordered the same dish. As both were brought out at the same time (and not by the chap who had taken my order), I asked if the one I had been given was gluten free (always my starting point, as that's the one to which I'm most sensitive). Confusion flitted across their faces - this was obviously news to them. I waited quite a while longer, before the dish returned, I started to peel away the wrapper (it was 'en papillote' - baked in a sealed package)... when suddenly a waitress rushed out to stop me!! Apparently this dish wasn't right either! They were going to do it again!! I was slightly peeved, and by now hungry! My friends were already pretty much finished with their main course, by then, and I was lagging behind. Other diners had come and gone in the meantime, but I thought, 'better safe than sorry'. Finally the dish arrived and as no-one returned to say it wasn't suitable, I cautiously tucked in. Only by this time, my side order of fries was cold and so was the side dish of greens (which had also had to be returned as it hadn't been done correctly first time either - I'd asked for it to be cooked in oil rather than butter). Oh, and my friends, who I had instructed not to wait for me, were just finishing their dessert!! See my point is, it MAY be 'easy to ask,' but it's not always easy to get the right answer! If the waiter/waitress/server does not speak English as a first language, it's difficult to know if they completely understand the message that you are trying to convey. 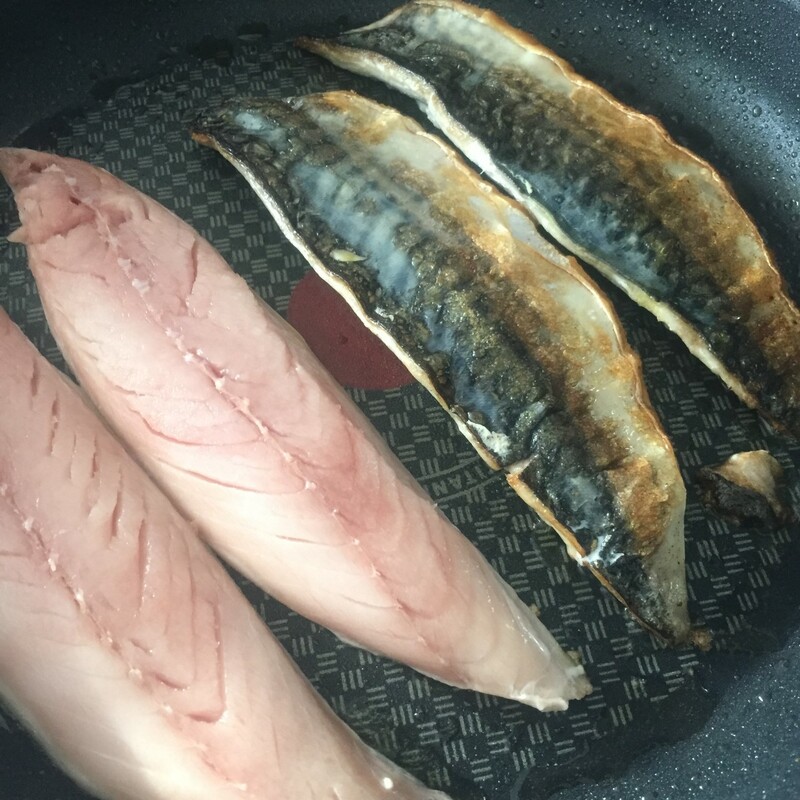 It's the reason why I tend to go self-catering when I'm abroad - if I read labels myself and prepare food myself, I feel much more confident of a safe outcome. However, in this country it is also quite common to come across staff who don't have English as a first language, and some of those are in positions of management too. It's all very well and good if they are proficient in English, but slightly concerning when you need to get an important message across and are not sure that it IS getting through. Unless you live with food allergies yourself, or have been trained thoroughly there may be gaps in the person's knowledge. The number of times I've been told, 'Oh, but there IS egg in it!!' when I've tried to confirm whether something contains dairy!! Of course, you and I know, that when I say 'dairy', I mean milk and the products made from milk. Milk (usually, although not always) comes from cows. Eggs come from chicken - completely different animals!! By the way, I usually use the term 'dairy' as it is a much broader term than 'milk'. If I use the term 'milk' people do not always make the connection between milk itself, and other products made with milk, such as butter or cream, or yogurt, or cheese etc. You may communicate perfectly well with the waitress/waiter, but what is the communication like in the kitchen? The more times the information has to pass through other people, particularly in a busy pressurized environment, the more chances there are that something can go wrong. I was particularly impressed with the Disney restaurants in Florida (you won't get the same service in Disneyland, Paris - just so you know), because the moment the server heard the phrase 'milk allergy,'( in regards to my daughter, who was still allergic at the time), they summoned the chef to the table and the chef actually CAME to your table and talked everything through with you. There's not many other places where we've been treated with anything like that care and attention! 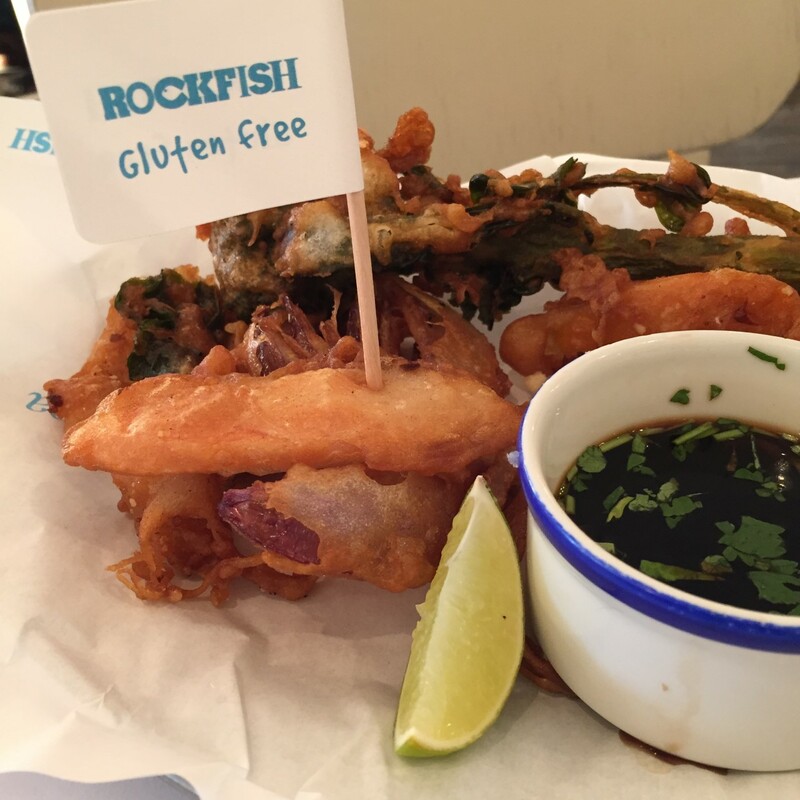 It's also one of the reasons I love restaurants that will repeat back your allergy information as they serve the dish, or stick a label in that says 'dairy free' or 'gluten free' - a la Cote or Rockfish. It's not something that they are required to do by law, but that 'best practice' reiteration of the essential knowledge, gives you more confidence that hopefully the message has really got through! Eating out with friends and family, or standing in a queue with other people who are are hungry, you can be horribly aware that by asking all the questions you may feel you need to ask, in order to be 100% confident about the food, you are keeping others waiting. Sometimes you get that little shuffle behind you, a sigh, a glance at a watch... Even as an adult, I hate it and feel the need to get it over and done with as quickly as possible. How much more so must many a younger person, especially when peer pressure comes into play?? Only a few months ago, The Hub's nephew (who has been known to be allergic to peanuts and sesame, since he was tiny, and fits into the 16-24 age bracket) had his first serious anaphylactic shock. It was the archetypal teenage error. He was at a party with friends, didn't think to check what was in the dip - it was humus, which he had no idea was made with sesame. He wasn't carrying his Epipens - because never having experienced a serious attack, he'd become complacent. Fortunately, his poor mother was only minutes way, was able to get there, with his medication, in minutes, and the ambulance didn't take long to get there, either. Otherwise, he could have become another statistic. Going back to my recent experience, I have no idea what caused the mix-up in the restaurant, it may have been multiple factors, but sometimes these things happen. You just have to hope that they notice in time to stop you taking your first bite. And this is not the first time this sort of thing has happened - although this was the first time it took the best of three, to make it right! This post is not an advert. I have not been paid to write this post. I am not sponsored in any way, even by advertising. I do not receive products free to review, although I have often been offered them. This is to try and maintain an unbiased approach. Any products listed in this post are here purely because they genuinely are the products we have used and enjoy consuming. They are included here merely to point people who are new to suitable products that they too may enjoy. All views expressed are my own (unless I've asked for The Hub's or Kiddo's). I try to tell is 'as-it-is'. One dish I used to love preparing, in the days pre-Baby, was stir fry - very quick, very easy and can be made in a multitude of ways, according to whatever ingredients you have available. It's made even easier, when you can whack in a ready made sauce! 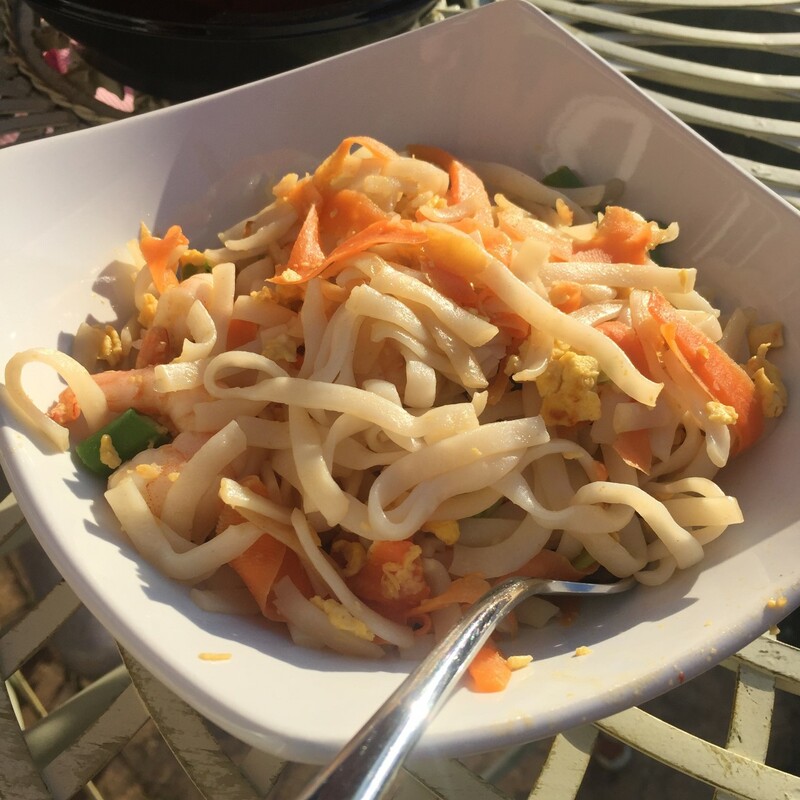 It was off the menu for a while in our house, because although we managed to find rice-based noodles, ready made stir fry sauces can be harder to obtain, if you are gluten and soya free! However... thanks to a relative newcomer to our store cupboard - Coconut Aminos, stir fry is back on the menu - just so long as we use veggies that Kiddo will eat. 2 carrots or 2 handfuls of mixed frozen veg. You will need a large frying pan or wok, to cook this dish. 1. Clean and chop veggies, fairly finely, so that they are easy to cook - carrot cooks easily when sliced into ribbons with a peeler - not so much when in big chunks. 2. Heat 1 tablespoon of olive oil and 1 of sesame oil in a pan. Add the raw chicken/prawns and cook on a medium heat, until they are cooked. Whilst cooking keep stirring and turning meat/prawns, to ensure that they are evenly cooked. 3. If you want to add egg, clear a space in the pan, break them into the pan, and stir them into a scramble. Then remove meat and eggs into a bowl. 4. Replenish oil, before adding in your veggies. Cook for a further three-five minutes, or so before adding the noodles, and keep stirring for another three minutes or so! 5. Add the meat/prawns back in and a couple of tablespoons of Coconut Aminos. Make sure everything is mixed together well, before serving, into bowls. Perfectly easy and great for swift summer dining! A pud would be good! When I first went 'dairy free', I can remember the panic. What were we going to eat?? Do you have one of those?? You know, a list of tried and trusted dishes. However, what's MY 'same old' may be different from yours, so if I share mine, and you share yours... hopefully we can all share a bit of inspiration! BUT, I'm NO Nigella... just so you know! Barnyard Pie - Chicken, bacon and leek, sweetcorn, mushroom, or whatever veg you like to add. It's made with gravy and topped with mash - much the same as Shepherd's Pie. 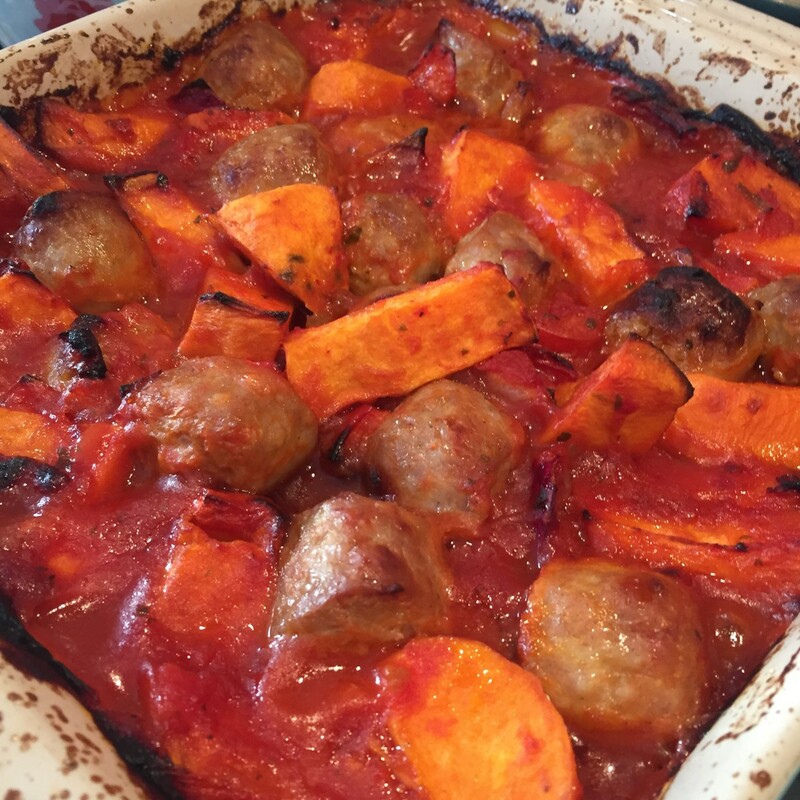 Lasagna - either making the sauce from scratch with dairy and gluten free alternatives, or using Dolmio smooth hidden veg and Tesco Free From lasagna sauce, with Violife or Daiya Shredded 'Cheese'. 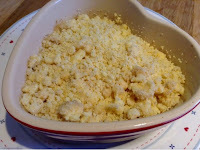 Fish Pie - using white sauce made with Doves gluten free flour, Pure sunflower Margarine, Almond milk and Violife grated 'cheese'. Paella (cooked with Kallo gluten free chicken stock) according to Jamie Oliver's instructions. Fish and Chips (a la Hub!) Using the deep fat fryer and gluten free batter for the fish. A wonderful dish to cook on a barbecue, but make sure you get the right pan! Pan frying fish is so quick and easy! 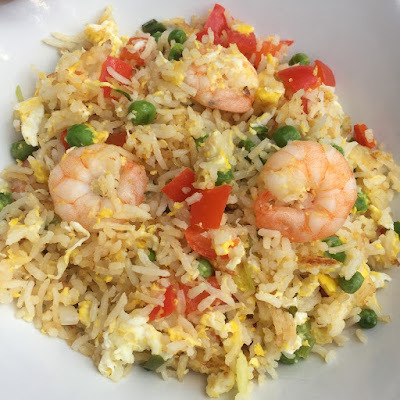 Chicken/Prawn (or both) Egg Fried Rice or Noodles. 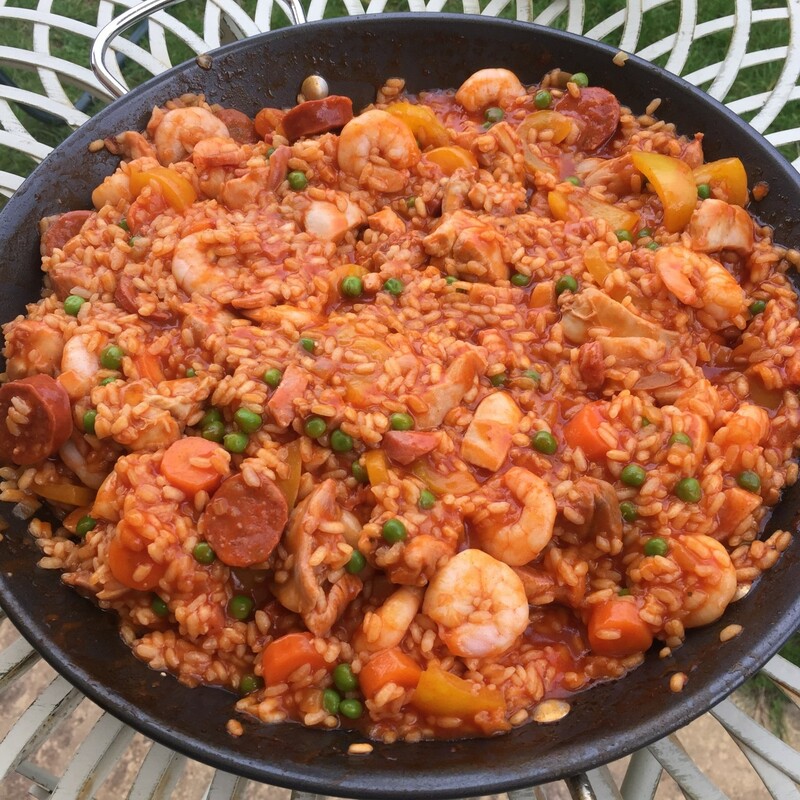 The rice can be cooked in advance and cooled or you can use a packet of Tilda ready rice, or two! I stick to Tilda because I know it is specifically gluten free, but there are other brands out there. Amoy Straight to Wok Noodles are good too! Egg fried rice is a real favorite in our house! Dairy Free Cheese - although that said, actual dairy cheese is far more nutritious than dairy free cheese, so I wouldn't normally choose this option, unless I was balancing it out with some other form of protein. My favourite 'at home' salad (if I can be faffed), is Chicken and Aocado with cherry tomatoes and a mix of salad leaves. Add in some boiled new potatoes to warm it up. 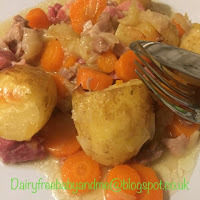 A great way to use up left over boiled potatoes! Mix up a couple of eggs, heat up some oil in a small frying pan, throw in the eggs, a handful of dairy free cheese and maybe some left over veg. Cook through and on both sides. You can make these from scratch, using a decent dairy free cheese alternative, or even these days buy them from the chiller in Sainsburys, Waitrose or Tesco. Dress them up or down by adding all your favourite toppings! If I'm really lazy, I'll heat up a Kirsties's ready meal, or an Amy's kitchen macaroni cheese, or perhaps one of Tesco's chilled Free From ready meals - I love the paella, and the lasagna. Marks and Spencer - sandwiches - depends on the season, but I've enjoyed their BLT, prawn mayonnaise. I have also enjoyed some of their 'Made without Wheat' products, such as pork pies and scotch eggs, but some of these options seem to have disappeared. Costa - Chicken, Chorizo and Rice - can be heated. Pret - Pret make a range of gluten and dairy free soups. My fave is Chicken, Rice and Broccoli, but sometimes I'll go for one of their salads (always check ingredients). 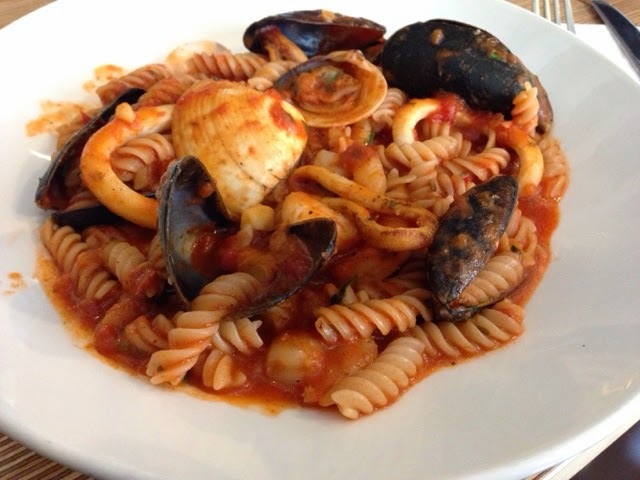 Leon (mainly London, but branching out more) do a range of dairy and gluten free options. It's fast food, but not as you know it! Yo Sushi! - not much of the menu is suitable, but there's enough to keep me going. I love the Salmon Selection, the Ebi Nigiri, the Salmon Maki, the Kimchi Squid (it's hot) or the Salmon Avocado Temaki (has to be ordered). Ask Italian - can do pizza with dairy free cheese and gluten free pasta options. Zizzi - Similar options to Ask Italian (they're owned by the same company. 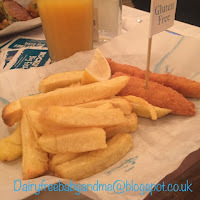 Pizza Express - Can now do gluten free bases and dairy free, soya free cheese, so befriend your server, find a basic pizza you like on the menu and they can amend it for you! Cote - Tuna Nicoise Salad - fries are safe too! Pub - the Wadsworth chain, is worth looking at, or St Austell breweries (in Cornwall). 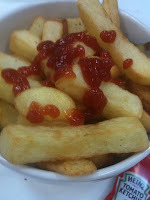 You can usually be sure of a safe Ham, Egg and Chips (separate gluten free fryer). 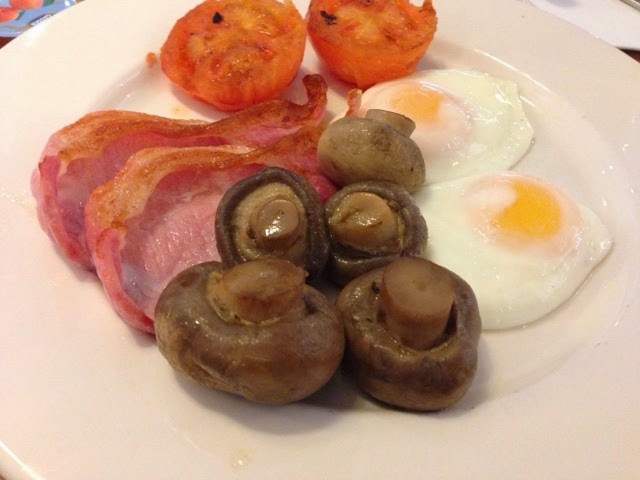 It's also worth checking out independent cafes, as they often include gluten free options, these days too! HOWEVER, if you eat out, you might not always get a great range of puds - mainly just fruit sorbets, just saying!! That said, Zizzi also do some kind of chocolate praline torte - no good for me because of some other ingredient - looks tasty, though! They serve it with coconut ice cream! Living dairy free has become such a way of life now, that it kind of catches me out, when people ask what they can eat that's dairy free. I'm not only dairy free, I'm gluten and soya free and the honest truth is, there's lots you can eat. Sometimes it's case of adapting or using dairy free substitutes, but there's no way it has to be boring... unless routine is your thing and that's the way you like it! If you need to find a dairy free substitute, there's plenty out there. Many like oat milk, others prefer coconut milk, my personal favourite is almond milk. My margarine of choice is usually Pure sunflower margarine (although they have undergone a recent recipe change, which I'm waiting to change back. Many supermarkets make their own branded dairy free margarines. For more ideas regarding milk substitutes, see this page here. OK, so these require time and a waffle machine, so these are normally set aside for a lazy weekend. We make ours with almond milk and Doves gluten free flour, and have never experienced any problems. I love mine topped with fresh strawberries or raspberries and a good dollop of Coyo coconut yogurt, drizzled with golden syrup. Totally LUSH! Kiddo prefers hers drizzled with chocolate sauce - Freedom is a good make, for those with multiple allergies. You can make these completely from scratch, with your dairy free milk of choice. Coconut milk is a good choice, but almond milk can also work, although you'll get a thinner, runnier batter with almond milk. 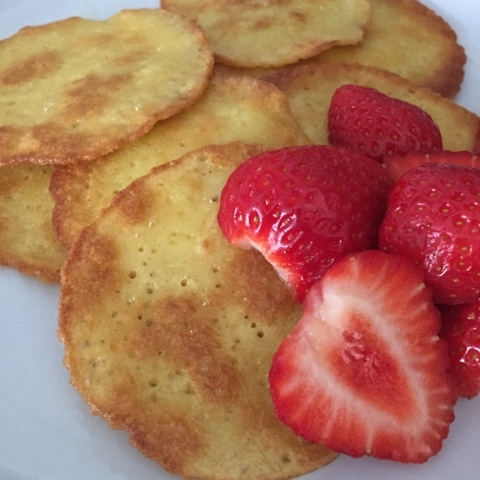 Being gluten free, I prefer using Mrs Crimbles pancake mix, as I like the blend of flours they use, but we've also used the Asda Free From Pancake Shaker. Chopped banana and golden syrup make a fab topping for these, or fresh berries and Coyo, as before. Sometimes we make a slightly thicker batter and make mini handheld pancakes, just for fun! Poached, fried (olive oil), scrambled (Pure margarine and almond milk) or boiled and dippy, all work for me! usually with toast! You really can't beat a slice of toast with a slice of bacon, topped with a fried egg. 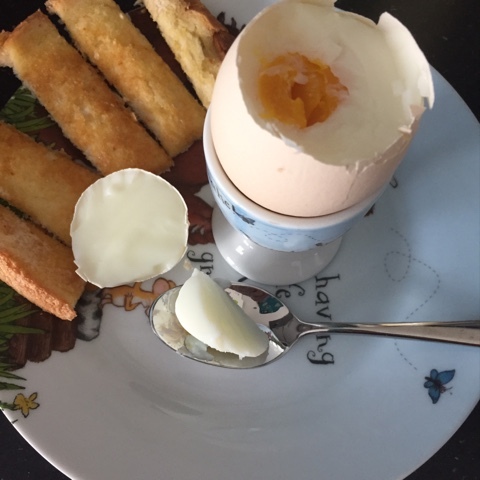 If you've a little bit of time, eggy bread is a sure winner! Simply whip up some egg with a little milk, soak up the mixture in some toast and fry the bread (in olive oil) on both sides, until golden brown. For a more indulgent version, poached eggs with avocado slices and some plum tomatoes on the side, get the thumbs up from me! Add a slice of toast and you're good to go! For the full nine yards, go full English! Although don't forget to ensure your sausages are free of nasties too. I love Tesco Finest Pork Sausages, Heck Pork Sausages and Rankin's. On a bit of a side note, if you're staying in a hotel, always get them to check what's in their sausages! Preferably, you want somewhere that will cook your food from scratch, so there's no chance of cross-contamination from the buffet. A good hotel will be happy to do this for you. Well, obviously eggs (as above) but also in a butty, with ketchup. Not everyday maybe, but certainly bound to give you a tasty start! 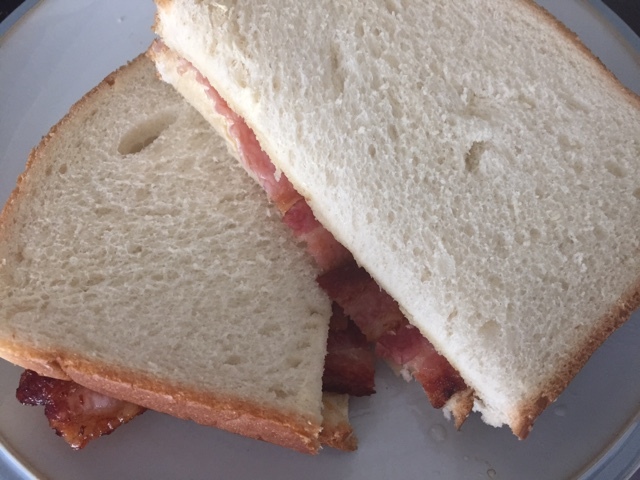 Simple but tasty bacon butty! Mmm! Yep! Those Kiddie tea time favourites. OK, you might not want to eat them everyday, but Kiddo has been known to eat these accompanied by a fried egg, or maybe fish fingers (make mine gluten free), or even chicken nuggets. They are super easy to cook, especially if you have an air fryer (we've recently invested)! On a similar note, Kiddo also loves those 'Smiley Face' potato things. Kiddo's favourite thing with potato waffles, though, has to be a slice of bacon topped with a slice of dairy free Violife cheese! Not to everyone's taste, but she loves it! I've always loved porridge!! I love it made with coconut, almond or hazelnut milk and a tablespoon of golden syrup, although you could use honey of you prefer and dress it up or down, with fruit, nuts, etc. Cereal is great for those days when you just need to grab something quickly and go! It's just a case of choosing your dairy free milk sub and then finding a suitable cereal. Being gluten free, I love a good gluten free Granola, or Nutribix, but if you're 'just' dairy free, you'll have a much wider range of options, e.g. Shreddies, Cheerios, Rice Crispies, Cornflakes, Weetabix etc. (always check ingredients, just in case they change). If all else fails, there's always the option of toast (again make mine gluten and soya free). 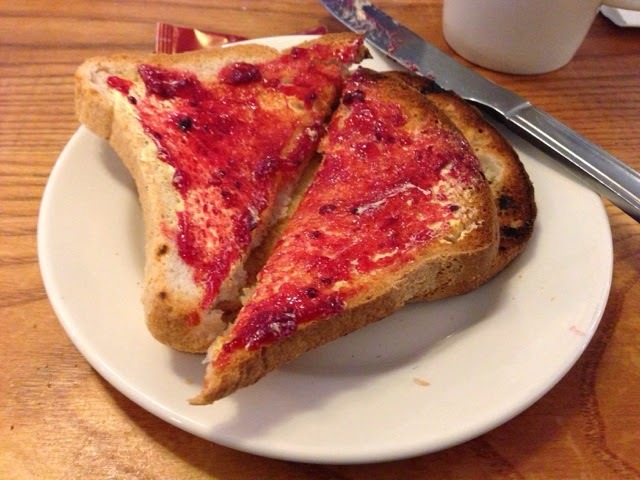 Many of the options are covered above, but if it's jam or marmalade, make mine homemade - preferably my Dad's! Now this isn't the most exhaustive list, but you get my drift - life doesn't end, when you become dairy free, it doesn't even (necessarily) take you in a new direction - just a slight curve! 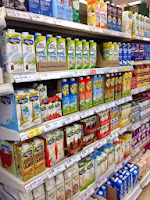 Which dairy free milk is best? Quick disclaimer: just so you know, if you're expecting Cordon Bleu food, you'll be sadly disappointed. This post is for those of us who need something more 'low maintenance'! I've been meaning to add this recipe to the blog for a while. It's a simple recipe to make and I love simple! It basically involves one dish, and a saucepan in which to cook the pasta, so less washing up... and what's not to like about that? 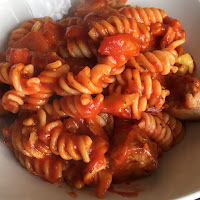 Quick, easy, simple and delicious! I may have mentioned before that Kiddo can err on the fussy side. Well, in actual fact she's getting a lot better about these things, but we still need to find ways to disguise the veg. in her life, which is where this little pasta bake comes in quite handy. At the moment, Kiddo says this dish is her favourite! Little does she know, that's she's eating far more veg. than she realises! You see we make it with the Dolmio hidden veg sauce - any other extraneous veg I try to include gets left behind in her bowl (unless its her good old favourite - carrots). Just to give you an idea of quantities in terms of persons this dish could feed, now that Kiddo has a good appetite, this serves us three with very little left over. A couple of handfuls of fresh or frozen mixed veg. of your choice. 1. Put a pan of water on to boil (for the pasta) and preheat the oven according to the instructions on the sausage packet. 2. Cook sausages according to packet instructions (I usually use Heck Pork Sausages, or Rankin's or Tesco Finest). If you use the dish you want to eventually contain the whole bake, it saves on washing up! 3. Pour the dried pasta (I usually use Tesco or Sainsbury's free from pasta - usually Fusili, but Penne also works well) into a pan of boiling water. Cook according to instructions, then drain. 4. Once sausages are cooked, drain off any excess oil, and chop them into bite-sized pieces. 5. Add the drained pasta, the jar of tomato-based pasta sauce (Dolmio hidden veg in our case) and a few handfuls of frozen or fresh chopped veg. of your choice. I often add sweetcorn, peas, chopped carrot or pepper. Use two forks to 'toss' the ingredients together, ensuring that you achieve an even mix of the ingredinets. 6. Top with grated cheese (I use Daiya shredded mozzarella-style cheese - see here). 7. Return dish to the oven for another ten to fifteen minutes - to melt the cheese. 8. Serve into bowls and Bon Appetit! So you've found us! Dairy Free 'Baby' and 'Me'! OK, so 'Baby' is no longer dairy free - she's finally grown out of it - it's only taken us eight years!! However, I'm still dairy free. I'm gluten free and soya free as well, among other things. I'm not blogging as much as I did - I don't have so much time for it, but I'm keeping it open, as a resource for others. Whatever your reason for dropping by - whether you're already a friend of ours and want to catch up with how we're getting on, or whether you're dairy free and are just popping in to see if this blog is any use to you, hope you find what you're looking for! We are also on Pinterest at 'Dairy Free Baby and Me' and Instagram too! More recently, I have started updating my Trip Advisor account 'DairyFreeBaby' also - in the hope that my experiences will help others. 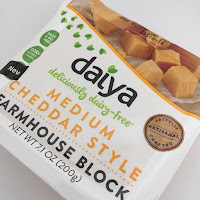 Weaning the Dairy Free Baby - First Steps! FAQ's: Is A2 milk suitable for those with a cow's milk allergy, or 'milk intolerance'? Is IKEA designed for us? Copywrite dairyfreebabyandme 2012. All rights reserved. Theme images by selensergen. Powered by Blogger.